A total of 55 records matched your search. A design with many polar region animals. Lovely tropical fish designs including Anthias, Picasso Fish, Beaked Leatherjacket File Fish, Blue Tang and Banded Gobies. Wonderful designs of different sea shells. Three designs in this collection include a Bear in a field, a wolf head study with a smaller wolf full body and a bobcat accented with snow covered branches. 2 rows of bird houses in a garden under a blooming weeping cherry tree. Animals that are Bordering on Extinction. "A collage of Native American culture and southwestern landscapes "
Cabbage and Carrot Bunny Kit -( New Zealand White)counted cross stitch kit includes 14 count fabric, pre-sorted DMC floss, needle instructions and charted design. Stitch count79Hx111W. The Cheetah is shown stitched on 14 ct. Natural Aida fabric by Charles Craft, Inc.
Do Drop In Stitch Count 70H x 225W Approximately 6 1/2 x 20 1/2" when stitched on the 11 count fabric that is included. Presorted DMC floss. Mat is not included in kit. A Dolphin in a splash of blue water. 103H x 94W - Kit includes separated DMC floss, 14 ct. Aida fabric, needle, instructions and design leaflet. Deatiled and realistic eagle and turkey from the Stephanie's American Wildlife series. Realistic animal designs with mother and baby include clouded leopard giraffes elephants dolphins polar bears whales and pandas. This collection includes three designs with rabbits, raccoons and a fox accented with horns symbolic of the fox hunt. A beautiful Koi pond full of fish and surrounded by the animals that visit. A collage of Cockatoos in a rain forest setting contained within the shape of a Cockatoo. There is also a a small Tree Frog in the design. A collage containing a Blue and Gold, Scarlet Macaw and an African Grey Parrot. 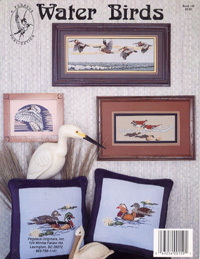 Naptime Counted Cross Stitch Kit - Stitch Count 100Wx107H. Approx. finished size 7 1/4 x 7 3/4. Kit includes presorted DMC floss, 14 count Aida fabric, needle, instructions and charted design. 6 designs include landscapes and snowflakes with elves and birds hidden in them. 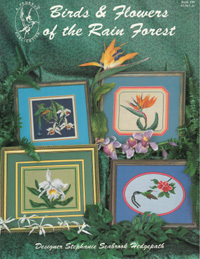 Kit includes separated DMC floss, 14 ct. Aida fabric, needle, instructions and design leaflet. Owls includes 5 cross stitch designs: A Great Grey Owl with wings spread across the night sky with the moon in the background, a Boreal looks aroung a tree, a Screech Owl peers out of his hole in a tree, a closeup head of a Barn Owl and Snowy Owl soars over a snowscape by the moonlight. Four designs include, Penguin Parenthood, Do Drop In, Penguins on Parade and Puffins. A beautiful black Swallowtail Butterfly on a Butterfly Bush. 11 designs featuring the bunny rabbit. 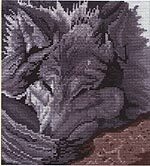 The Pack Counted Cross Stitch Kit - Stitch Count 198Wx96H. Approx. finished size 7"H x 14 1/4"W. Kit includes presorted DMC floss, 14 count Aida fabric, needle, instructions and charted design. 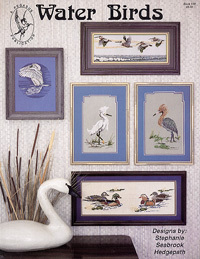 This book of water bird designs by Stephanie Hedgepath includes Killdeer, Reddish Egret, Snowy Egret, Trumpeter Swan, Mandarin Ducks, Wood Ducks and Pelicans. A nautical collage containing many colorful tropical fish and sea mammals in the outline of a Whale. 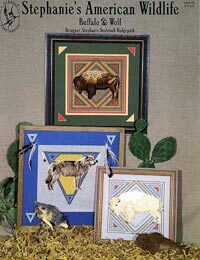 Three designs in the collection include a buck and doe in the field, a buck head study and a smaller design of a buck suitable for a quick and easy project. "Winter on Fox Hill - a red fox in a snow scene. Shown stitched on 26 ct. White Birch Heatherfield fabric by Wichelt"